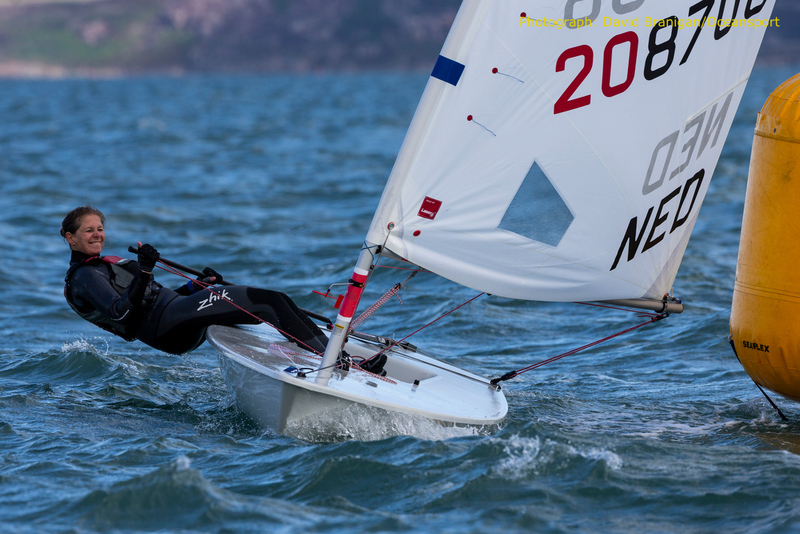 (Dún Laoghaire, Ireland) Following a well-earned rest day, the 301-boat Laser Masters World Championships fleet returned to breezy Dublin Bay today where class leaders for the most part held their leads with just four races remaining in the event. Brett Beyer from Australia won his sixth race of the Masters class series but then appeared to falter in the second race of the day when he rounded the first mark in the high teens. But after playing a series of wind shifts perfectly over the next lap of the course, he finished in second place and extended his lead to an impressive 23-point advantage. Sweden’s Niklas Edler delivered a 2-1 result for the day that dislodged Australian David Whait from second overall, though only after the tie-break. Just four points separate second to fourth places. Anticipation is quietly building for the host nation as Atlanta 1996 veteran Mark Lyttle held his overnight lead of the Standard Grand Masters class following a steady day with a third and fourth result. The Irish Olympian’s home club is the National YC, the co-organiser of the Championships with the neighboring Royal St. George YC. And in the Apprentice Masters class, Ireland’s Damian Maloney, Pete Smyth, and David Quinn delivered a first, second, and third line-up for the eighth race. 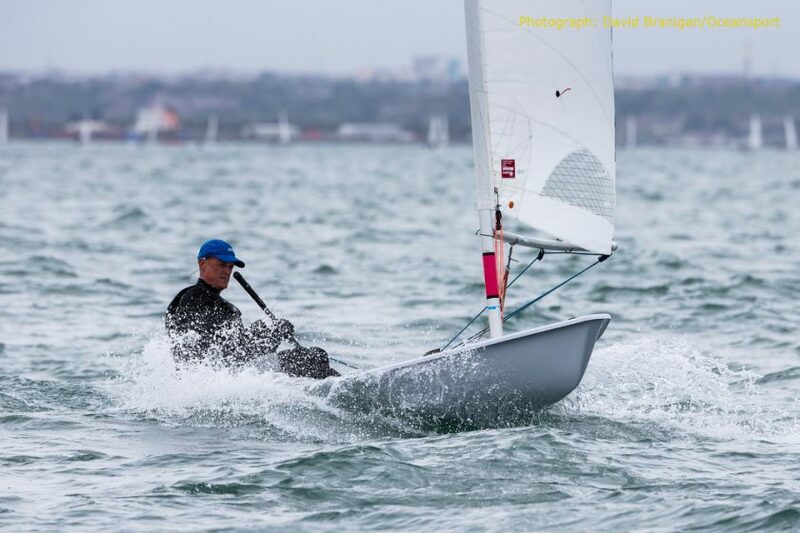 Leaving his slightly off-pace start to the Championships well behind him, Germany’s Wolfgang Gerz won his sixth consecutive race for the 15-boat Standard Great Grand Masters class and has 13-point cushion going into the penultimate day. New Zealander Scott Leith remained on course to add the 2018 Championships to his tally of ten world titles with another two bullets in the Radial Masters class today. Britain’s Ian Jones had a 2-3 result for the day and trails in second place by 15 points. Bill Symes of the United States has the Radial Great Grand Masters class in a vice-like grip after another two bullets for the day and now enjoys a 22-point lead of this 37-strong division. His countryman Peter Seidenberg in the Legends division (ages 75+) also has a firm grip on his class after a win and a third place for the day. The forecast for remaining two days is set to continue the pattern of 15-knot average winds with gusts to over 20 knots, accompanied by the dreaded shifts that have caught most of the sailors out at various stages of the series. However, while earlier forecasts suggested a storm might affect Saturday’s final, it now appears that the strong winds and rain won’t reach Dún Laoghaire until nightfall. This means the full schedule of 12 races is likely to be sailed including the final race that counts towards the “Bart’s Bash” attempt to be the largest sailing event in 24 hours at multiple locations in aid of the Andrew Simpson Sailing Foundation.